Next up was the 2007 Tre Anelli Pinot Grigio Riserva (Central Coast), featuring a floral nose that Jessica thought smelled “like honeydew” and “delicious.” The palate was distinctly Californian, with some round dairy notes sneaking in there, but still featured plenty of the acidity that we look for in a nice crisp Italian version. Nick said it was much less sweet than the nose had suggested, but he thought it was well-balanced, and complimented the long lemon/lime finish. Nothing Pinot egregious about this one! 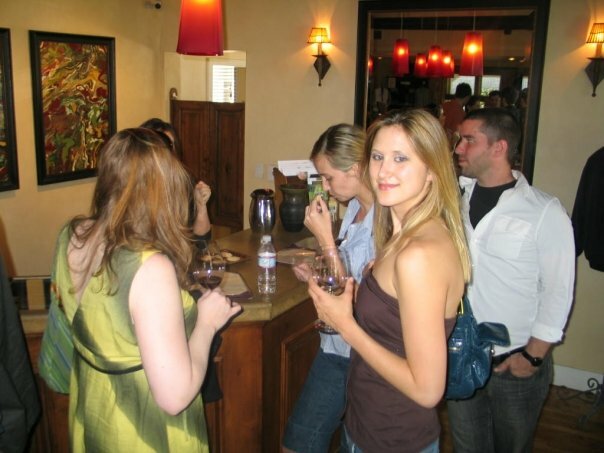 Moving on to the reds, we sniffed out the 2005 Tre Anelli Tempranillo (Santa Barbara County), which several people said had a “porty” character to the nose. I picked up some raspberry, a touch of vanilla, and some nice gaminess. The palate was soft and juicy — Jessica said it tasted like “cherry Juicy Juice, poured over a piece of wood.” Jason picked up some chocolate on the front, followed by firm tannins on the back end. Round and soft, with a touch of acidity, this was a pleasantly ripe expression of the grape. 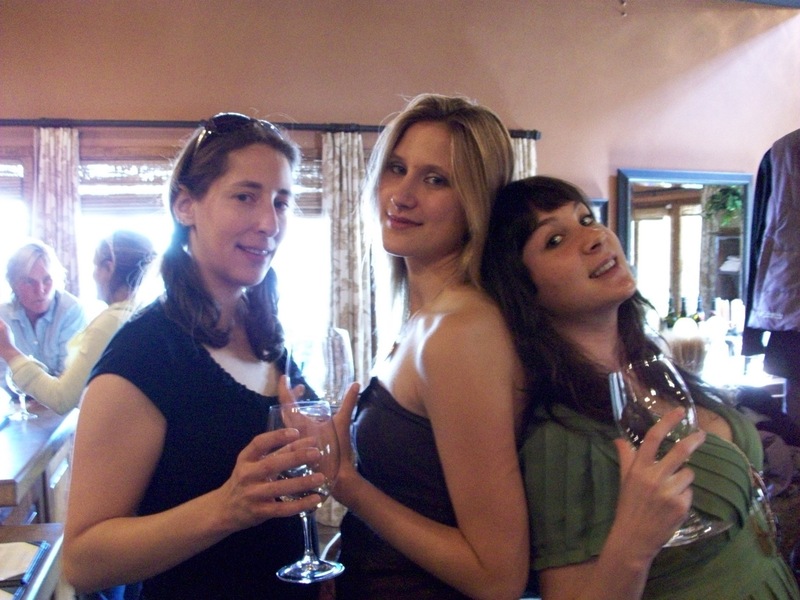 We all looked forward to the 2006 Tre Anelli Sangiovese (Santa Barbara County), as the Sange has long been one of the Winos’ favorite varietals. The nose was rich and inky, featuring notes of ash and campfire, along with some dried blueberry character. The palate, however, skewed in a much fruiter direction, serving up big portions of dark berries galore, like one of those super-antioxidant berry juice blends. Some acid and pepper chimed in as well, but they didn’t distract from the fruity opulence of this delicious bottle, one of the darkest and most decadent Sangioveses we’ve tried. Wrapping things up was the 2007 Tre Anelli “Walker Vineyard” Dolcetto (Santa Barbara County). In Italian, Dolcetto means “little sweet one,” and the versions from Piedmont often run on the light side. Why, then, was this the final wine of the tasting order, a slot usually reserved for the heavy hitter? The answer became clear as soon as the wine was poured: when grown under the generous Santa Barbara sun, the little sweet one grows up fast. Dark and tannic, the palate offered inky, teeth-coating notes of loam and charcoal, and may have felt a bit tight; I’d love to see how it drinks after a few years of mellowing out. Like the other Tre Anelli bottles we’d tasted, the Dolcetto was a distinctly new-world interpretation of a classic old-world wine, and it’s amazing to taste the way those two worlds integrate in the glass. Tre Anelli’s tasting room is a must-visit for fans of both worlds, new and old. We moved next door to Tre Anelli’s sister winery, Consilience, a Winos favorite since our ’06 visit. With the Dolcetto clinging stubbornly to our tongues, we swished a little water and then stuck out our glasses like champs. First up was the 2006 Consilience Grenache Blanc (Santa Barbara County), done 100% in neutral oak. The nose struck a balance between floral and woodshop notes, with a little bit of honey as well. Our honey note replicated itself on the smooth palate, which featured refreshing acid, some caramel notes, and a clean citrussy finish. 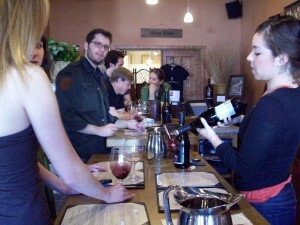 This was a hit with the group, and prompted a couple Winos to open their wallets. 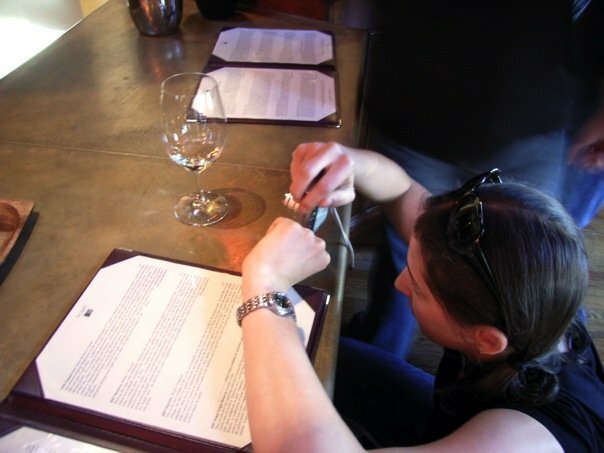 Intuitively sensing that we were in the mood for a white Rhône blend, our wine liaison Angela served up the 2006 Consilience “Cuvée Mambo” White (Santa Barbara County), a blend of Viognier, Grenache Blanc, and Roussanne. The Viognier had a field day on the nose, tossing up tons of florality, and some tropical fruit notes made a play as well. “Wow, very nice,” began my notes on the palate. More floral action greeted our tongues, along with some vanilla and the slightest touch of sweetness. “It’s like all the best things in a bakery at once,” came one comment from the group. Angela said she thought the various grapes complimented each other nicely, and there was no disagreement from our camp. 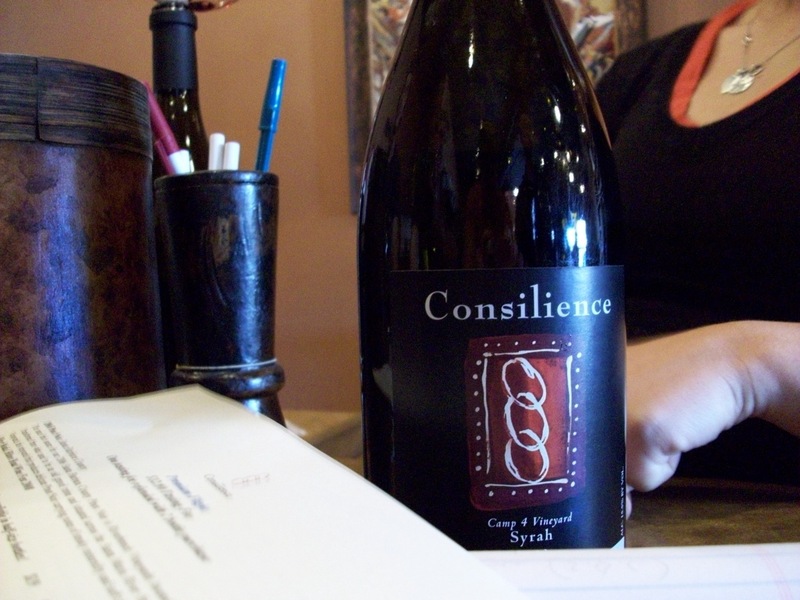 Predominantly specializing in Rhône varietals, Consilience also makes a Zin, a Cab, and the 2006 Consilience “Bien Nacido Vineyard” Pinot Noir (Santa Maria Valley), which offered a nose of coffee and Christmastime red berries. 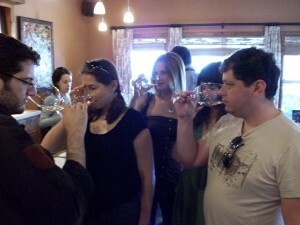 Nick and Jessica picked up some cherry and strawberry, respectively, two notes which repeated on the palate. “It has a nice evolution in the glass,” said Jessica, and indeed the wine progressed from its initial “berry jelly” fruit to a woodsy expression, eventually revealing its mild tannins on the finish. Wrapping things up was the 2005 Consilience “Cuvée Mambo” Red (Santa Barbara County), a blend of Syrah, Petite Sirah, Zinfandel and Grenache. The nose smelled to me like an incredibly rich potting soil, the kind that’s still moist and pungent when you rip open the zip-lock (am I the only person who always wants to just eat that stuff straight out of the bag?). 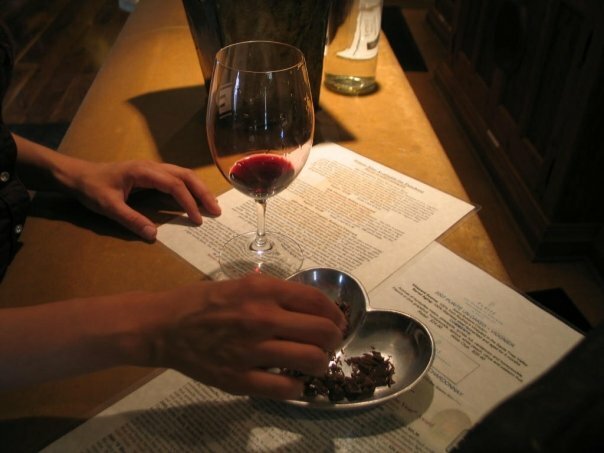 The palate was rich and dark, decadent bordering on depraved, with flavors of dried fruit, milk chocolate, and even fruit snacks — all with a nice layer of ground pepper and powdery tannins. This cushy featherbed of a wine was the perfect way to end our Consilience feasting, and I use that term because “tasting” doesn’t at all convey how full and satisfied you feel when you walk out those doors. In a blind lineup, no one’s going to confuse any bottles from the Consilience stable with their austere Rhône counterparts — but, then, no one’s supposed to. Another big success story of the ’06 excursion was Epiphany Cellars, and we figured a return trip was definitely in order. 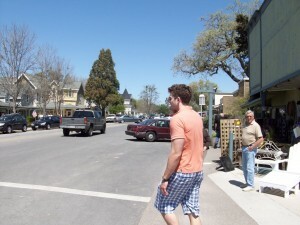 Epiphany, the brainchild of Fess Parker’s son Eli, produces only about 4000 cases a year (the eponymous “epiphany” was allegedly Eli’s realization that small production was the path to distinctiveness in Santa Barbara). 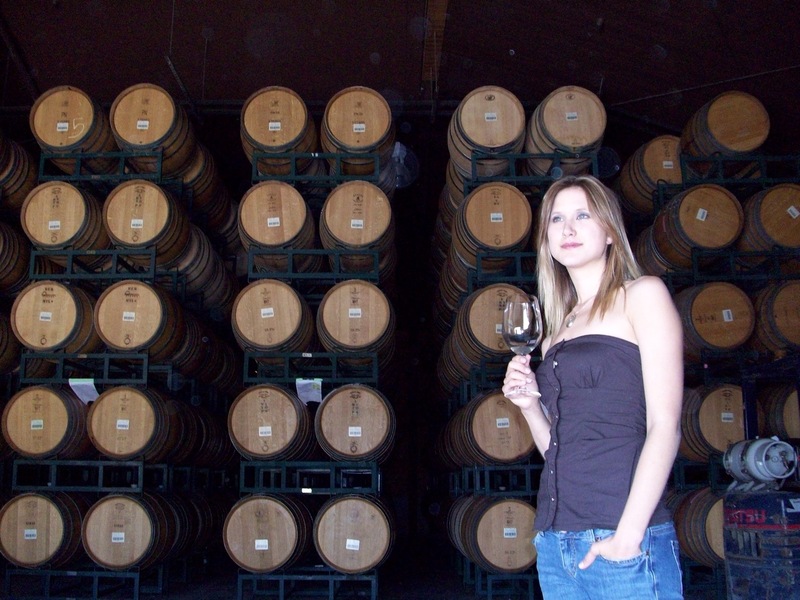 We started our tasting with the 2006 Epiphany Pinot Gris (Santa Barbara County), featuring a fruit-salad nose of pears, peaches and grapefruit; Andrea picked up some dried apricot as well. The palate offered up those same fruit notes in a light and breezy package, with just a hint — or maybe only the illusion — of sweetness. “I like this a lot,” said Nick. “It’s light and crisp, and not too short on the finish.” And even with 14.7% alcohol, the wine was nicely balanced. A big winner. Next up was the 2006 Epiphany Marsanne (Santa Barbara County), the first 100% Marsanne we’ve had in quite a while. 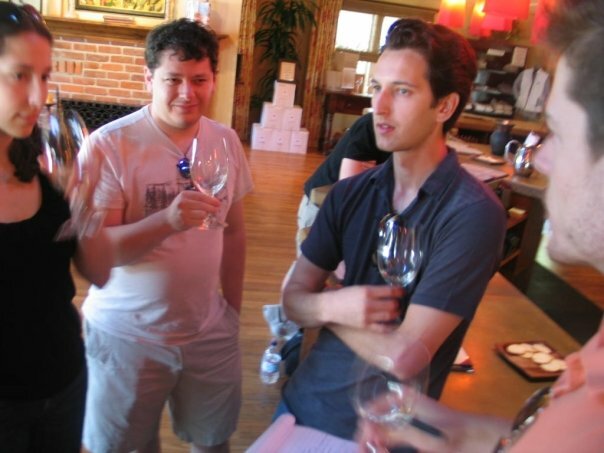 Marsanne is one of those grapes that I always feel really retains its core identity whether it’s grown in France or California, and Nick picked up an element on the nose that we usually associate with French wine. “I think it has some of that… what does Lang call it? Dishwater,” he said. For my part, I smelled some beeswax and honey, along with a good dose of the “white peach” mentioned in the tasting notes. The palate featured that classic Marsanne texture, a distinct creaminess without any of the butter or dairy flavors you get on a heavily-oaked Chardonnay. Instead, we got a nice helping of orange marmalade and some decent acidity, but the smooth texture made the whole package go down nice and easy. We moved on to the 2007 Epiphany Grenache Rosé (Santa Barbara County), a light pink little number that spent 24 hours of its fermentation on its skins. The palate was light and fresh, a bit reminiscent of strawberry jam on toast. After all the reds and a couple of high-alcohol whites, we could fairly expect a delicate rosé to get lost in our tired mouths, but the Grenache proved surprisingly resilient. Pleasant and refreshing, the palate boasted understated strawberry and cherry notes. “Everything’s in balance,” said Nick. “Not too much of anything.” More so than any of the single-varietal whites in the Epiphany lineup, this wine felt tailor-made for warm-weather daytime imbibing. 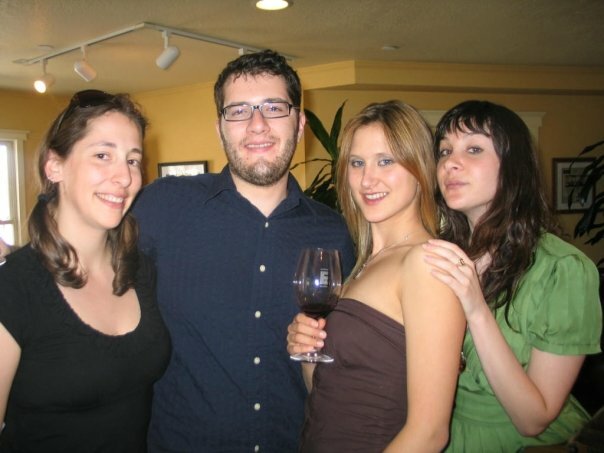 Moving on to the commies, we started things off with the rosé’s big brother, the 2005 Epiphany Grenache (Santa Barbara County), which featured plenty of bright red fruit on the nose, along with hints of incense and cherry cola. The palate, although fairly light-bodied, offered up big flavors of candied red fruit. The wine felt plump and generous on its light frame — kind of like that friend of yours who’s more-or-less athletic, but also enjoys eating well, and doesn’t mind carrying around a couple extra pounds of padding. Ground pepper played us out on the long finish. I snagged myself a bottle of this one for future drinking. Next up was a longtime Winos favorite, the 2005 Epiphany “Rodney’s Vineyard” Petite Sirah (Santa Barbara County). The nose was chocolate and brambles, along with some gamy action, and a distinctive smell that I pegged as “typewriter ink.” After a dark-skewing nose like that, the palate surprised us with its light-ish red character — light-ish at least as far as Santa Barbara Petites are concerned. 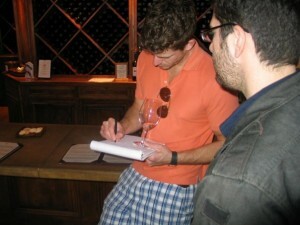 “A lot of ripe red fruit… not too dark and ridiculous!” I noted. Some decent tannins kept our attention throughout the long, unselfish finish. Santa Barbara is known for its Syrah, and the “F Block” at Rodney’s Vineyard is pretty legendary in its own right. The 2005 Epiphany “F Block” Syrah (Santa Barbara County) served up some dark roasted coffee on the nose, with even the slightest suggestion of Boston baked beans. Jessica said it smelled “like the woods,” and we also picked up some gamy notes, Worcestershire-style. The palate offered up more of that gaminess, along with some delicious raspberry character. 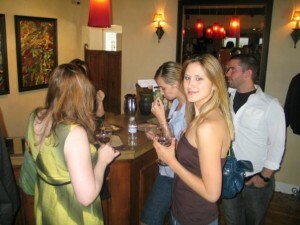 Despite the depth of flavors, the wine wasn’t overwhelmingly full-bodied by any means. 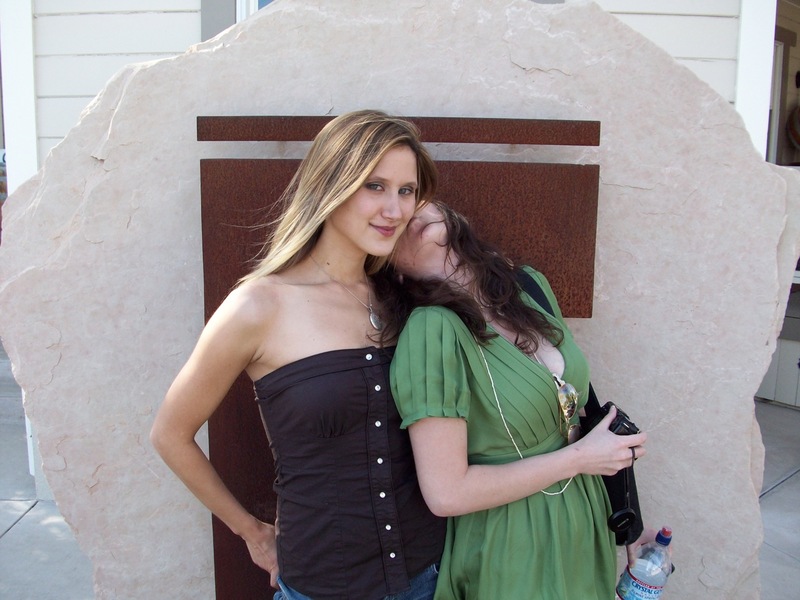 Jessica found herself wishing it was “a bit thicker,” but Andrea thought it was perfect. 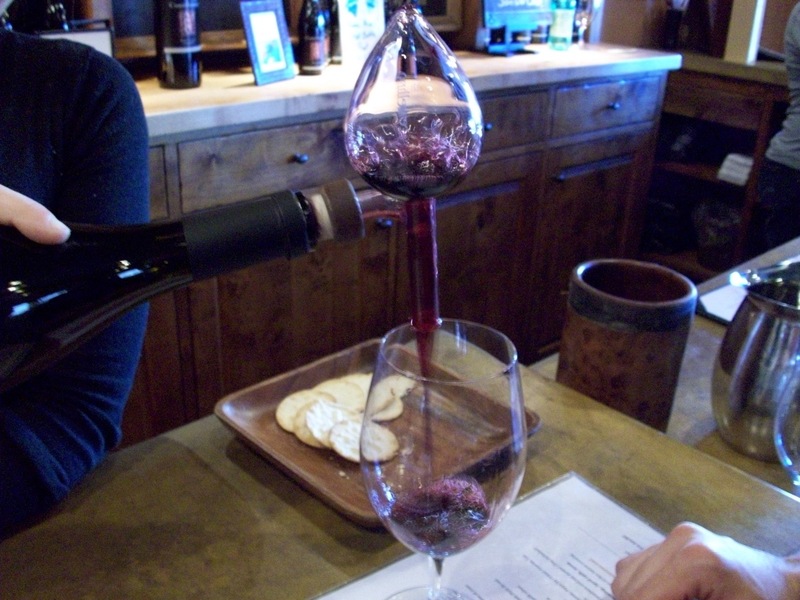 We wrapped things up with Epiphany’s flagship, the 2005 Epiphany “Revelation” (Santa Barbara County), a blend of Syrah, Grenache and Petite Sirah. The plush nose was apparently exactly what Jessica had been looking for — she said it was “like a pillow filled with raspberry jam.” Also present were touches of heat, smoke and game. The palate was deep and generous, and not a far cry from a similar blend we’d tasted earlier, the Cuvée Mambo — fruity, juicy, and very rich, the Revelation served up gobs of milk chocolate dusted with ground pepper. 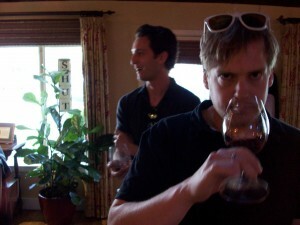 Nick applauded the presence of firm tannins offering some backbone, and we all delighted in the dark chocolate finish. 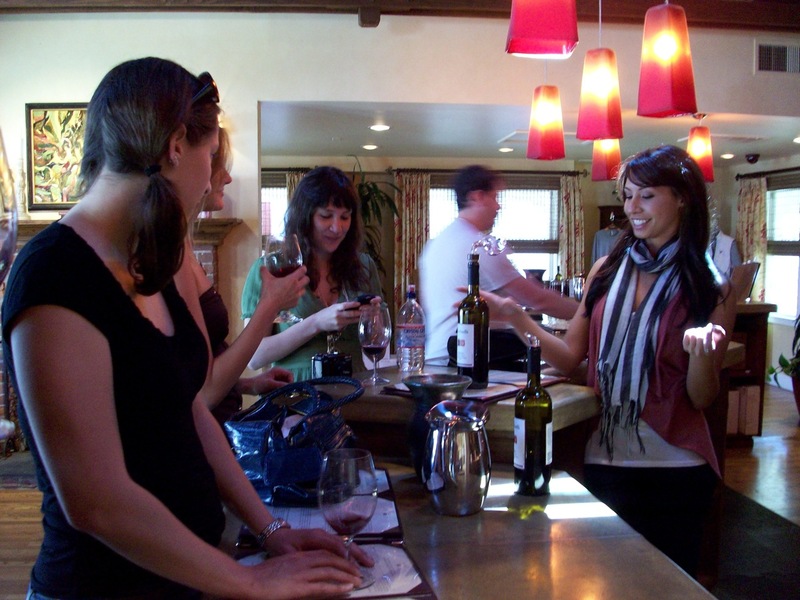 With so many quality tasting rooms within such a short distance, it’s hard to go wrong stopping in for a tipple at any of Los Olivos’ fine establishments. 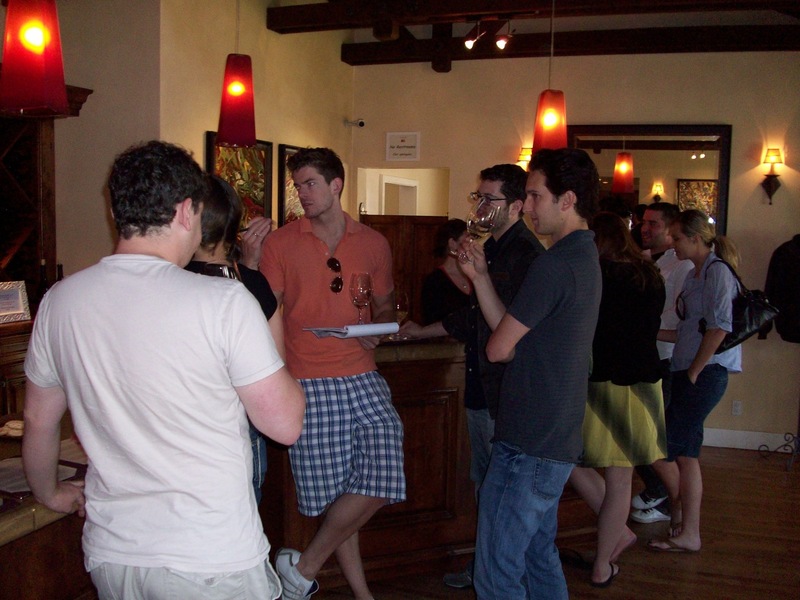 However, there are only about six hours in your wine-tasting day, so some selectivity is a must. Wherever else your boozy wandering takes you on Grand Street, the Winos enthusiastically recommend stops at Tre Anelli, Consilience and Epiphany for a diverse and satisfying sampling of what’s going on in Santa Barbara these days. With their vision fuzzy and their heads still a-throb, weary Winos had been dropping like flies all afternoon, forgoing the promise of additional free wine to head back to Los Angeles and face their impending Monday morning responsibilities. 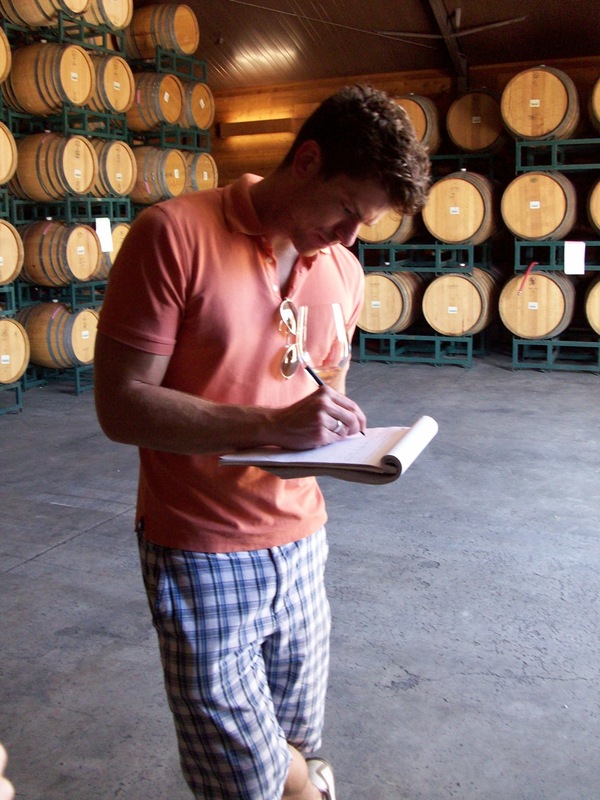 Only the most diligent of us had the mettle to make our 4pm appointment at the place of employ of our favorite millennial winemaker. 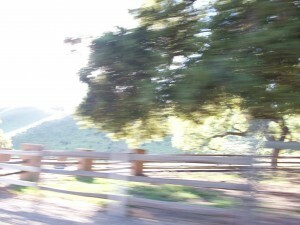 “And then there were three,” laughed Dave, as Andrea, Vanessa and I made our way up the Fess Parker driveway. 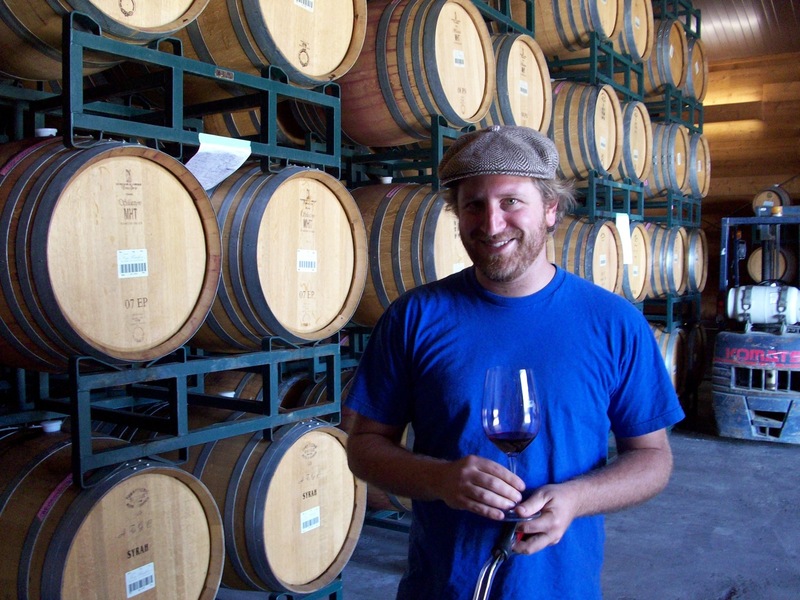 Dave Potter became an assistant winemaker at Fess Parker following apprenticeships in Australia and Côtes du Rhône, and spends most of his workday at the winery’s production facility in Santa Maria (he also crafts his Municipal Winemakers label at the Fess winery). 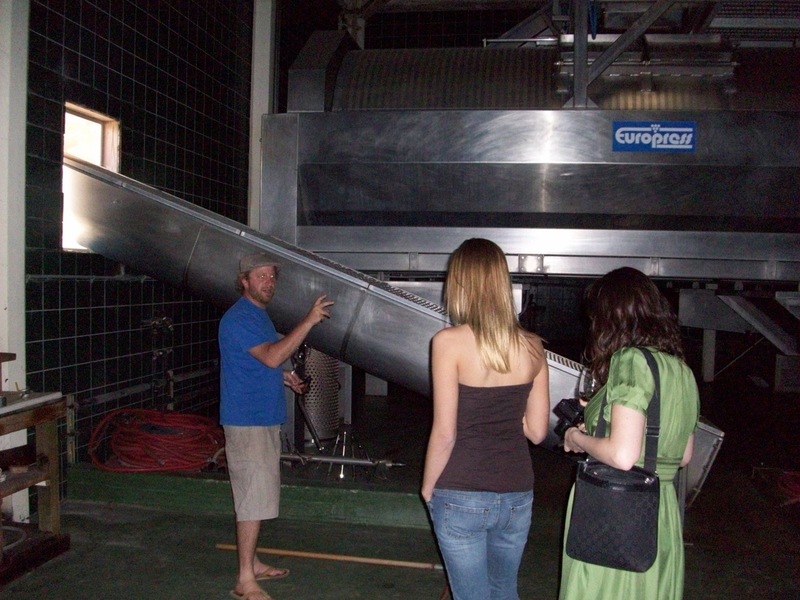 He took us into the back room and showed us the massive bladder press, which squeezes the juice out of the grapes by enclosing them in a steel cylinder and inflating a huge bag. The basket press, which operates by forcing a large plate down on to a steel basket full of grapes, “gets less juice yield, but the wine is cleaner,” he said. When pressing his Riesling grapes, Dave uses the “free-run juice” — the juice that flows freely from the grapes before pressing — for the Bright White, and the “press juice” for the Sweetie. 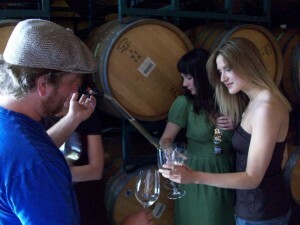 Dave poured us a quick sample of the upcoming vintage of Fess Parker Viognier, still aging in its steal tank. About 20% is done in steel, with the remainder aged in barrel. “The steel fermentation and aging gives it a fresh lift,” said Dave. “The oak portion will have more richness — this is more a pure fruit expression.” The wine was incredibly bright and buoyant, with flavors of lychee and vanilla wafers. “It’s obviously still cloudy, which comes from the suspended yeast,” he explained. The wine will be bottled in July for a release this winter. We headed out to the barrel warehouse behind the winery, where barrels were stacked five high and ten deep all around the massive room. “It’s like Donkey Kong heaven!” exclaimed Vanessa. 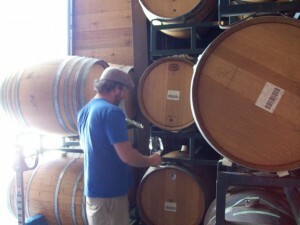 Dave grabbed a wine thief and tapped into a barrel of Roussanne. “This wine still has a little dissolved carbon dioxide, which gives it a prickle,” said Dave, “but once it gets racked, it’ll lose all the excess CO2.” Racking is the process by which the dead yeasts are removed from the wine. “They all settle to the bottom and form this sludge, which is called the lees,” said Dave. A hose is then used to pump the clean wine out so the lees can be removed, and then the wine is pumped back in. 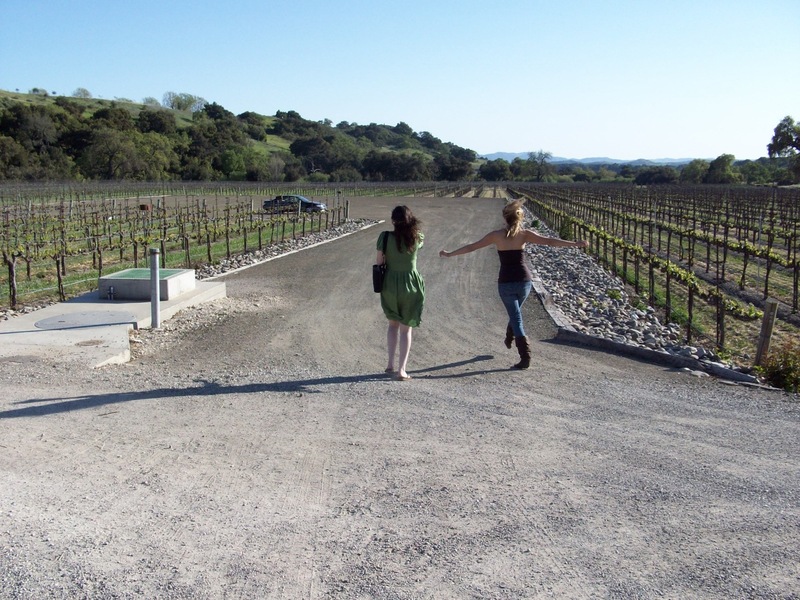 By this point, Andrea and Vanessa had decided that sitting out in the sunshine was a bit more workable than trying to remain standing, so we reluctantly admitted that it was time to wish wine country bon voyage. It had been a shenanigous and edutoxicating weekend, one that served as a timely reminder of the plethora of tasting opportunities accessible to us LA Winos just a brief two-hour drive north.